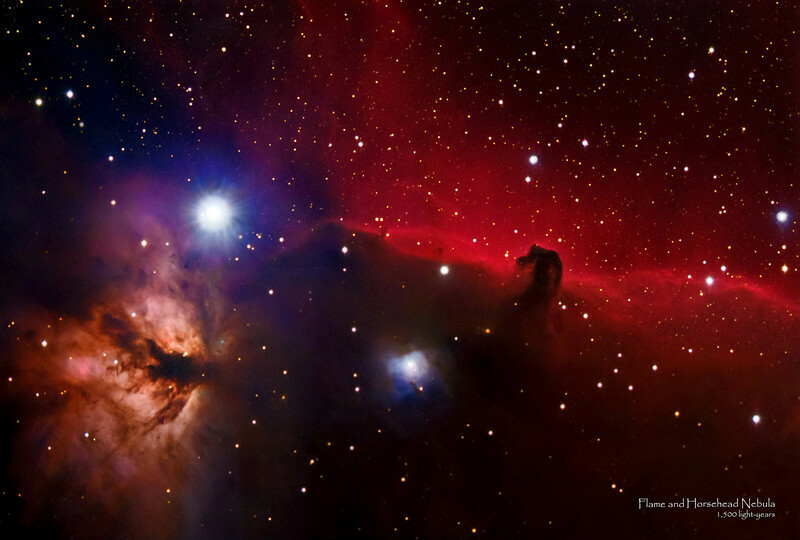 Horsehead Nebula (right) and Flame Nebula (left) - 1,500 light years from Earth. The Horsehead Nebula (also known as Barnard 33 in bright nebula IC 434) is a dark nebula in the constellation Orion. The nebula is located just below (to the south of) Alnitak, the star farthest left on Orion's Belt, and is part of the much larger Orion Molecular Cloud Complex. The Horsehead Nebula is approximately 1500 light years from Earth. It is one of the most identifiable nebulae because of the shape of its swirling cloud of dark dust and gases, which is similar to that of a horse's head when viewed from Earth. The shape was first noticed in 1888 by Williamina Fleming on photographic plate B2312 taken at the Harvard College Observatory. The surrounding region also contains a multitude of different objects all unique in their own right. The bright emission nebula in the lower left is NGC 2024 (the Flame Nebula). Infrared studies have revealed a huge cluster of infant stars hidden behind the dust and gas of NGC 2024. The bright blue/green reflection nebula to the lower left of the Horsehead is NGC 2023. Interstellar dust reveals its presence by blocking light emitted from stars or nebulae behind it. Dust is composed mostly of carbon, silicon, oxygen and some heavier elements. Even organic compounds have been detected.